Over the last number of weeks Colaiste Na Riochta parent’s council have been really busy helping our schools fund raising drive. More parents than ever before been involved and we hope for this to continue in the future to help grow, develop and promote our school throughout the Listowel and North Kerry area. 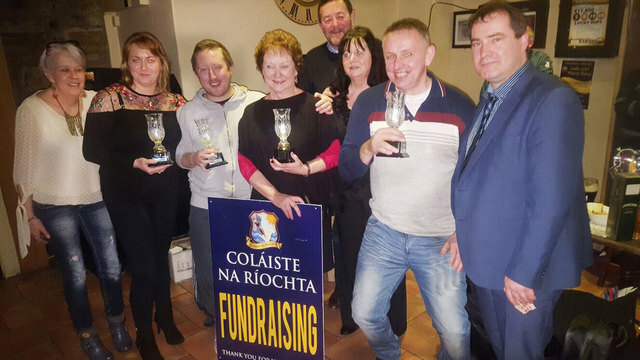 On Friday the 10th of February we had our Parents Council quiz night in Brosnans Bar Listowel. The night was a great success, with an excellent turnout of eager quiz buffs. In the weeks running up to the quiz, parents were busy knocking on doors of local business hoping to acquire spot prizes for the night. We would like to thank all businesses who contributed so generously. Great fun was had in Brosnans and we would like to thank the parents council for the organisation of the quiz and those who took part on the night. Well done to the winning team which included 3 members of school staff, the quiz queen Kathleen Nolan, Deputy Principal Iseult Glynn and SNA Noel O’Sullivan. Sincere thanks to all in Brosnans bar for ensuring we had such a great night, we are already planning for next year. 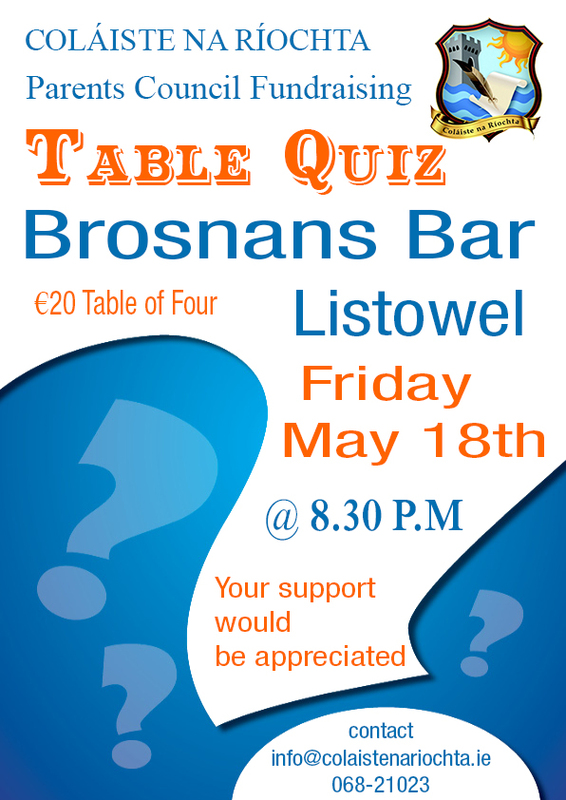 Between quiz entry fees, a raffle and donation we raised in excess of €850. Colaiste Na Riochta’s parent’s council is always evolving and improving, we look forward to many more parents becoming involved in the future.